But when the new Gmail tabs came out, I figured I better check them out. And when I did, I liked what I found. So I committed to using Gmail.com to check my personal email for the next week. And now weeks later, truth be told, I hardly ever go to my personal inbox in Thunderbird–it’s so much faster and easier to do it within Gmail. And the tabs? They make my email life easier in so many ways. 1. Emails that are just to me (and usually more important and personal) are there at first glance. As much as I know my inbox shouldn’t be my to-do list, it’s the way my clients get in touch with me (in addition to Facebook messages and the occasional smoke signal), and therefore it dictates a lot of my day’s to-do list. So I don’t want to be overwhelmed with social network notifications or email newsletters when I first check my email for the day or get back on the computer after a long weekend. I need to see the important things first so I can plan accordingly. Gmail puts the emails that are just to me right there in my Primary tab. I can read, reply, and archive as necessary. Then and only then is it time for the other tabs. 2. Social notifications are within their own tab for quick and easy removal. My inbox used to get flooded with notifications about who said what on Facebook and who had recently favorited a Tweet I was mentioned in. I like to get email notifications for my social networks so that I can keep up on the go without always having to use slow mobile net. But at the same time, if I am logged into Facebook all day I can just ignore my Social tab in its entirety, except to do one click and Archive them all when the day is done. 3. Promotions are waiting for me when I’m done with the pressing things. I habitually unsubscribe from emails that clutter up my inbox, sending me on rabbit trails when I need to stay on task. But there are still some blog posts that I want to get via email (because truth be told, it’s a rare week that finds me with any time to visit Feedly). And of course, there are update letters from missionaries and newsletters from my favorite authors that I can’t get any way but email. Yet I would rather read those when I have some time to digest them rather than just hitting delete because I need to get down to my more pressing emails. So I love that my Promotions tab keeps all the lovely reading material ready for when I have more than sixty seconds to spare. I tried activating the other two tabs, but “Forums” and “Updates” split my emails in too many confusing categories. If you hang out on a lot of support forums or message boards, maybe those tabs would help. (And so far, I haven’t seen any options for creating your own custom tabs. Think an email went to the wrong tab? Drag it into the right tab and tell Gmail whether to always put emails from that sender in that tab or not. Still hate the tabs? Want your inbox back? It’s as easy as clicking the gears icon and “Configure Inbox”. Find out more in Gmail’s help. How about you? 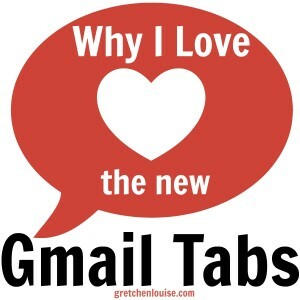 Do you love or hate Gmail’s new tabs? Do you ever visit your “Promotions” tab? I too started using GMail for personal emails but for a different reason. Apple Mail started going in circles trying to deal with GMail and my personal account is HUGE which made the problem worse. So to cut down on the congestion, I kept my personal email out of the loop. More than anything it allows me to stay focused on important matters vs. all of the matters going to my other email accounts (I’m ashamed to mention how many I have). Since it’s the only one open most of the time. I don’t miss much.